This morning, while searching for good blogs to do, I came across an article published yesterday on HelloGiggles, titled “Delta is trying to make you less sad by giving you free pizza, proving that it is the supreme airline,” which in no way reflects my experience of the Delta terminal at LaGuardia airport last night, where I went in the hopes of flying to Atlanta to visit my family for the Jewish holiday of Passover. So I investigated the Hellogiggles article and found that it is based on a widely reported story that broke Wednesday, when hundreds of Delta flights were canceled due to inclement weather in the airline’s home base of Atlanta. 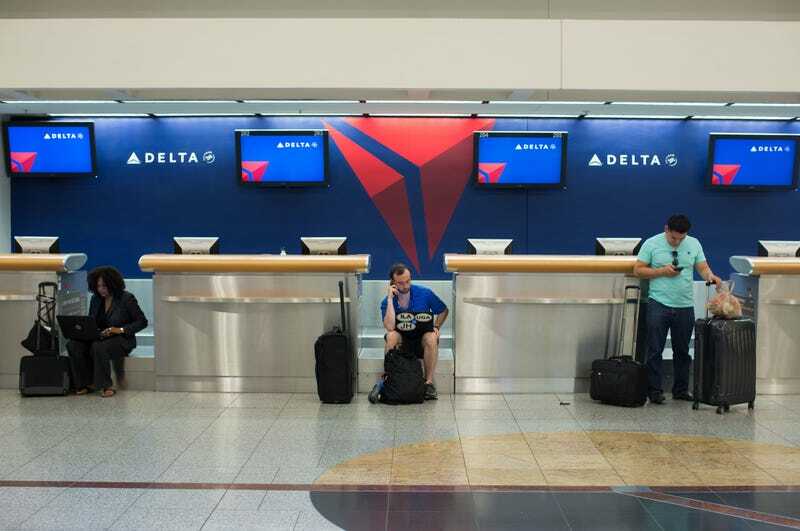 Subsequently, Delta ordered about 600 pizza pies for customers grounded in Atlanta and nearby airports, which, according to a company spokesperson, is something they do often to placate customers who’ve been negatively impacted by severe weather. In this case, it also generated a lot of good press for Delta. Based on a hasty perusal of Twitter and my own two eyes, the #deltameltdown persists. According to CNN, Delta has canceled 3,000 flight as of today, so it’s news (it is! ), maybe it has even affected you, and what I have to report, personally, is a total lack of free pizza, not to mention sky travel. I can already tell that this blog is turning into the Yelp post I always wanted to write. Please bear with me. When I met my dad at LaGuardia at six yesterday, we were informed upon checking in that our 8 p.m. flight had been delayed an hour and a half. We affirmed to one another that this was no problem at all, in fact, it would give us more time to eat airport dinner for two hours, an activity that is strangely appealing to both of us. All we had to do was make it through a medium-size security line. “Kafka,” said the TSA passport-checker, when it was finally my turn. It was a disarming word to rattle off, decontextualized, in an airport security line. “Your hat,” she said. I had forgotten I was wearing a baseball cap which says, “Kafka” on it. Should I remove the hat?, I wondered, anxiously. “I just read The Trial,” the officer continued. “I didn’t like the ending,” she said. I didn’t have the chance to ask why. With security behind us, my dad and I decided to spend the next couple hours at “Crust,” an unfortunately-named Italian restaurant in the Delta terminal where you can pay for pizza, and wine, which is what we did. People around us seemed on edge, even for an airport. My dad stood before a place-setting at the counter because a woman had moved his stool to the far end of the restaurant for a better view of the flight announcement screens. My dad and I joked about the food taking so long, and how it made absolutely no difference, because our flight was so severely delayed. They weren’t funny jokes. As the hours ticked by, it seemed like a great many of the flights were getting canceled. One of those flights, to Orlando, was literally booked full of children who thought they were going to Disney World and it would not be an exaggeration to say that, in general, they took the disappointment better than their parents. By 11 I was drunk-tired and our flight was canceled too. We were informed that the next direct flight through Delta to Atlanta would leave Monday. My dad was put on hold with the airline in excess of three hours. The stressed out adults seemed to each be testing at least one of two ineffectual strategies: yelling and begging. My dad opted—very briefly, to his great credit—for the latter, telling the woman working our gate that he would pay double, whatever it took, he had to be there. I explained to the woman that my dad’s new girlfriend, who’s never met our family, had already arrived in Atlanta and would have to fend for herself for several days. The woman was was very understanding. At this point there wasn’t anything left to do but reclaim the bags we’d checked. This also took a long time, which riled up the disappointed Delta customers further. “Are any of these bags from the Atlanta flight?” this one guy kept shouting. “Why won’t they talk to us? Why won’t they even look us in the eye?” raved another. “Because they’re bizarre,” proclaimed a mother, eerily calm. “It’s an arm-length thing,” I repeated. “I know, I know,” he responded, patiently. “Hand it to that guy.” So I did. All I remember after that is telling my dad in the cab line that, in a way, our pizza actually took five hours.